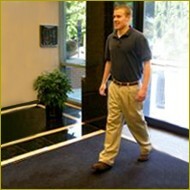 Artis developed Smartmat under a contract from the Centers for Disease Control and Prevention (CDC) to accurately count walking humans. The Smartmat system is comprised of pressure-sensitive mats, data capture devices, communication systems, and analysis software. 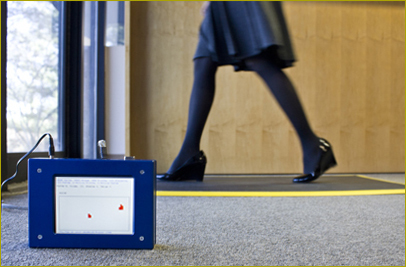 Smartmat counts and reports pedestrians’ paths from their detected footprints. The program first expands compressed data received from the data accumulator, isolates individual footprints, filters out high-frequency noise, computes direction and speed, connects footprints into paths, displays a summary of results, and, optionally, writes the analyzed print and path to a data file. 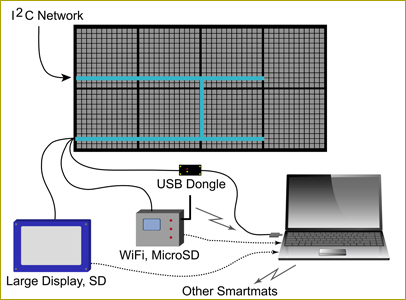 Smartmat connects directly to the internet. Turn it on and communicate through its WiFi interface with your browser or cell phone from anywhere on earth. Multiple mats can be managed, monitored and reported. Smartmats are built from up to 64 one-foot-by-one-foot sensor squares. Large mats can be rolled up for transport (4′ diameter), while smaller ones are transported flat. Each mat is connected to a data collection point with a short cable. Small mats can be battery operated for about 2-3 days. Automatic, no human observation required. Low cost compared to other surveillance means. Easy to set up and relocate. Resembles industrial carpet in appearance. Ruggedized and battery operable for outdoor use. Comes packaged with sophisticated traffic pattern analysis software. 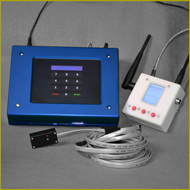 Three different data collection devices are available. The large LCD screen device features SD card data storage and the ability to control other devices through its RS232 serial port. Control is through the LCD’s touch screen. Analysis results can be displayed in real time on the screen or dumped to the storage media. The smaller LCD screen device features microSD data storage and user interface through 3 push buttons. Data can also be communicated through an optional WiFi interface. Analysis can be performed on the device or raw data recorded for analysis elsewhere. The low-cost USB dongle connects to a personal computer or laptop. A Windows™ interface provides the same functionality as the stand alone units.